We talked to Ray Griggs, the writer/director/producer of Super Capers, opening today. He explained to us how he tried to bring a Mad Magazine sensibility to his kid-friendly superhero epic. We watched Super Capers the other day, and it's very cartoony. (As you can tell from the exclusive clip we posted on Wednesday.) It's really very much aimed at small kids, and doesn't make much effort to include extra layers of stuff aimed at grown-up audiences. But your toddlers will probably love it and want to see it a dozen times. 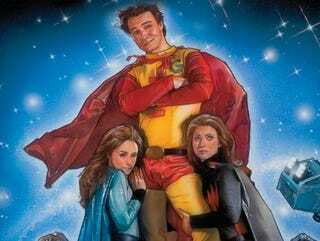 Griggs told us it was important for him to tell a real story, instead of simply parody existing superhero films, like other comedies (like Superhero Movie) have done. At the same time, he works in a lot of tributes to science fiction films from the past few decades, including Back To The Future and Men In Black. Partly, these tributes emerge because the Super Capers' resident inventor, Herbert, is a huge movie buff. And Griggs wanted to make a movie that included the stuff that inspired him when he was a kid. "The movie is for kids... just paying homage to the great science fiction films we grew up with," says Griggs. And so far the response from kids has been great, even as many adults have panned the film. "A lot of the stuperhero movies today, you can't take kids to, like Watchmen or Dark Knight." He likes seeing kids come out of a screening of his movie, excited about all the silly superhero sight gags, like the puffer-fish hero whom Griggs himself plays. And Griggs is a huge superhero geek, who reads Superman and Batman comics compulsively and has a Superman tattoo on his arm. His house is full of superhero memorabilia. Another big part of what sets Super Capers apart from other superhero comedies is the degree of world-building that Griggs goes into. He said he wanted to create world where superheroes were common, and maybe the equivalents of Batman and Superman are off being awesome somewhere. But the main heroes we meet are these dysfunctional halfway-house people. The movie's only out on 80 screens this weekend, but if it does well, it could go wider. It was all an independent undertaking, with Griggs doing everything himself, until finally Roadside Attractions picked it up. So anyway, it's definitely a movie just for kids. And those of you who took your small children to see Watchmen? You know who I'm taking about — I saw and heard your kids! — this would be a really good, non-borderline-child abuse, thing to take them to instead.